Esigo 2 Classic is the wooden wall-mounted wine rack in solid oak holding 28-44 bottles, modular wine rack, classic design, optimises space when furnishing wineries and wine cellars. Esigo 2 Classic is a highly detailed design wooden wine rack: Made in Italy style with the passion and love that craftsmen put into their work, dedicated to those who love the warmth and unique features of wood, its endless shades of colour that make every product a unique and unrepeatable item. 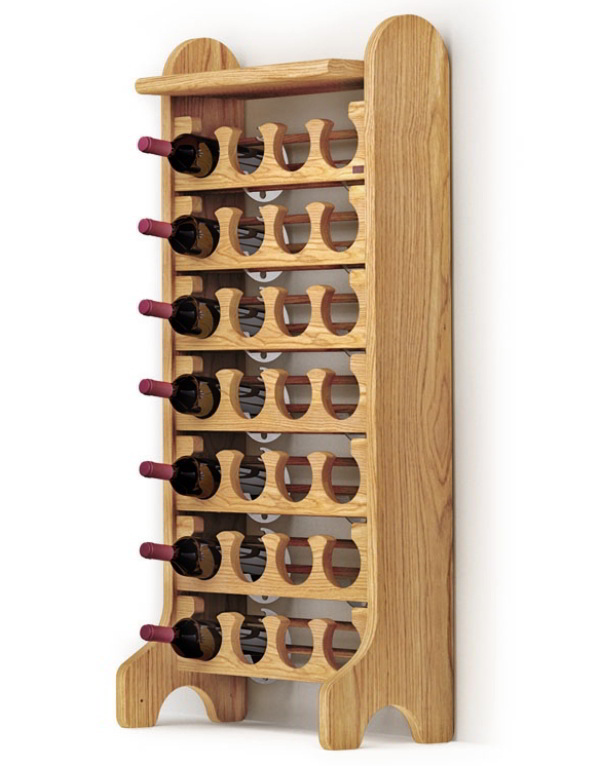 It is a capacious wooden wall-mounted wine rack that holds from 28 to 44 bottles of wine and, thanks to the patented system, it holds the wine bottles at just the right angle to guarantee ideal wine storage conditions. It is modular and optimises spaces for the wine shop, wineries tasting rooms, retail shops and wine cellars furniture; it is your own wooden wine rack with an unmistakable, prestigious and exclusive design.